Following a report from AllThingsD earlier today claiming that Apple will introduce the iPad 3 in the first week of March, The New York Times is now weighing in with its own sources corroborating claims of a faster processor and a "truly amazing" screen in a package nearly identical in appearance to the iPad 2. The claims line up with a number of previous rumors about the iPad 3's improvements, with a high-resolution display being one of the most highly-anticipated upgrades for the new device. Earlier today, photos of a Sharp display claimed to be for the iPad 3 also surfaced, although the screen's resolution can not be verified from the photos. 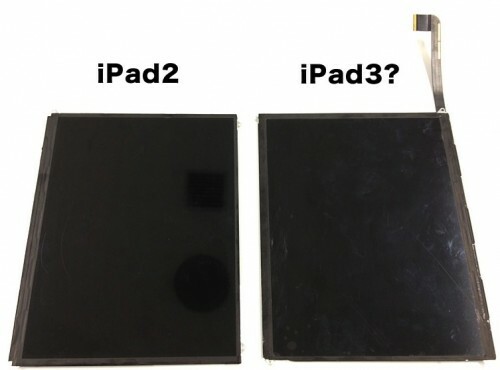 Indications that the iPad 3 will be nearly identical in appearance to the iPad 2 are also supported by recent photo leaks showing the rear shell of the device inside and out. Maybe Apple should sell iPad assembly kits since all the parts are available before launch lol. Enough foreplay. Let's get this thing out already. "who did not want to be identified because Apple is not fond of leaks." Tim Cook: "Jony, check it out, I made a couple of anonymous calls and it's already on Mac Rumors"! "Truly amazing..."? Now that Steve's gone I have to get my crappy superlatives from generic "Apple employee" guy? We seem to be getting all the iPad 3 rumors out of the way in one day here! What more can we possibly learn about this from now to the beginning March?? lets be honest, nothing posted has been an surprise, you can predict better CPU and screen, the screen is almost a given for the 3, nothing really sup rising here, you can almost guarantee that apple with keep the 2 and drop the price and use the 3gs - 4 model and sell both. if it looks identical to iPad 2 that means I can spend my money on it and my girlfriend won't even know it's a new model. Interesting. So does this being a Sharp screen mean their fancy new-fangled IGZO screen technology worked out and we won't have a dual light bar setup? If a transistor in each pixel of a panel becomes smaller, the panel lets more light pass. This advantage translates into lower power consumption and higher resolution. Sharp reported a reduction in power consumption of about 33% for a 10-inch-wide prototype panel compared to an equivalent panel with amorphous-silicon TFTs. The IGZO transistors feature electron mobility 20-30 times higher than that of amorphous-silicon thin-film transistors.